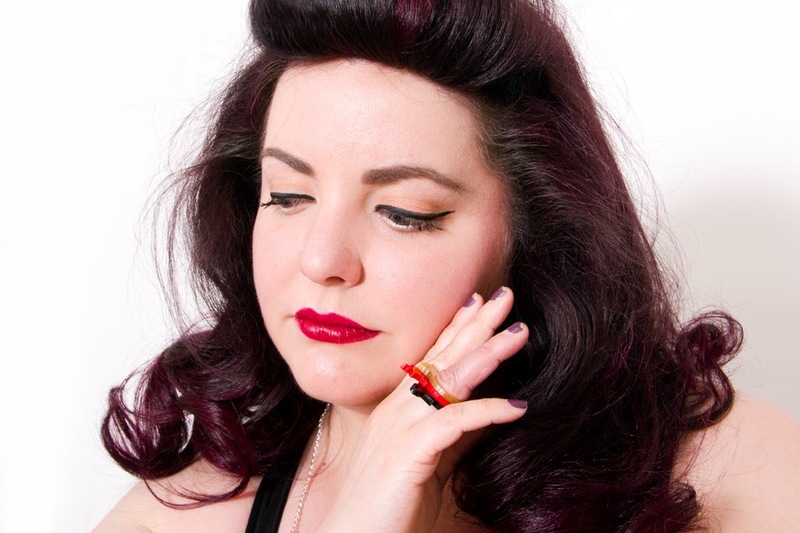 I like my jewellery bright and bold, so completely fell in love with Snapdragon Designs the second I stumbled across them. Based in Kent, this husband and wife tag team create an incredible range of laser cut delights from both paper and perspex. With a whole selection of jewellery and greeting cards on show via their Folksy store, they combine intricate designs with a super kitsch cuteness. With both city living and fairy tales at the core of their products, each item is filled with both whimsy and charm. They very kindly offered to send me a few pieces from their range to review, and what turned up certainly didn't disappoint - I audibly gasped with delight upon opening it. 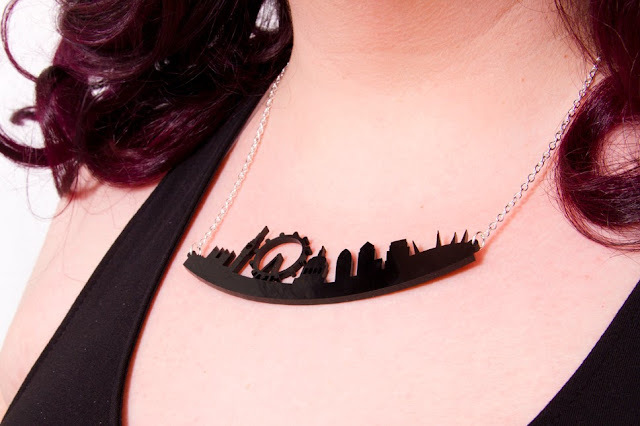 London Cityscape Necklace - £20. 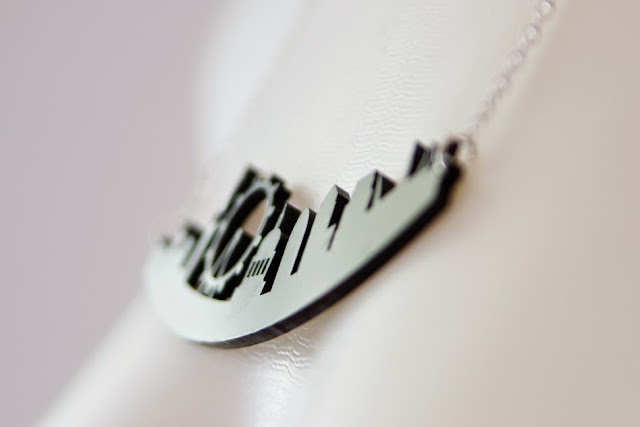 As someone who is very much a Londoner, there was no way I wasn't going to fall in love with this iconic skyline necklace. 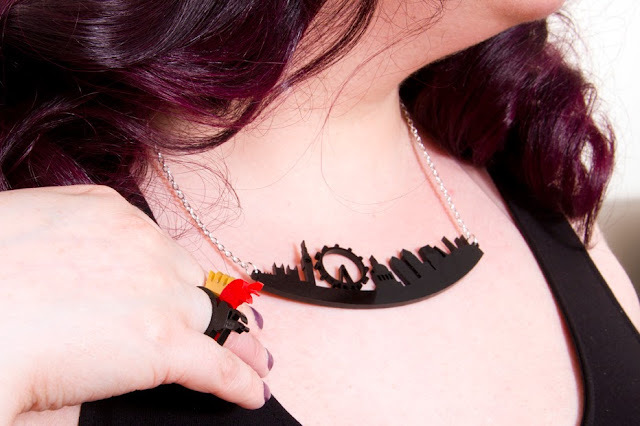 The London Cityscape captures a mixture of old and the new in black acrylic, and comes fastened on a silver plated, lead and nickel free chain. Every time I've worn this, someone has commented on it so it has proved to be a really excellent conversation starter! 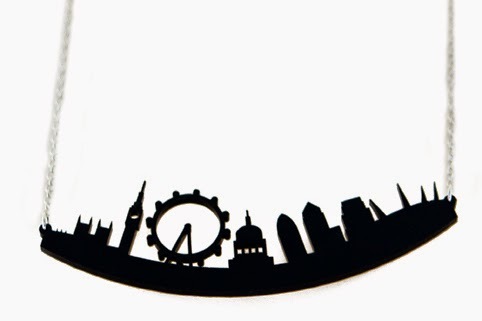 The London scene measures approximately 12.2cm across, and is the perfect size sitting across your chest. Acrylic Snow White Ring Set - £12. Who doesn't love a good fairy tale? This stunning Acrylic Snow White Ring Set will absolutely enchant you, with the set of three featuring a red apple, a black pick axe with lamp and of course, a golden crown. 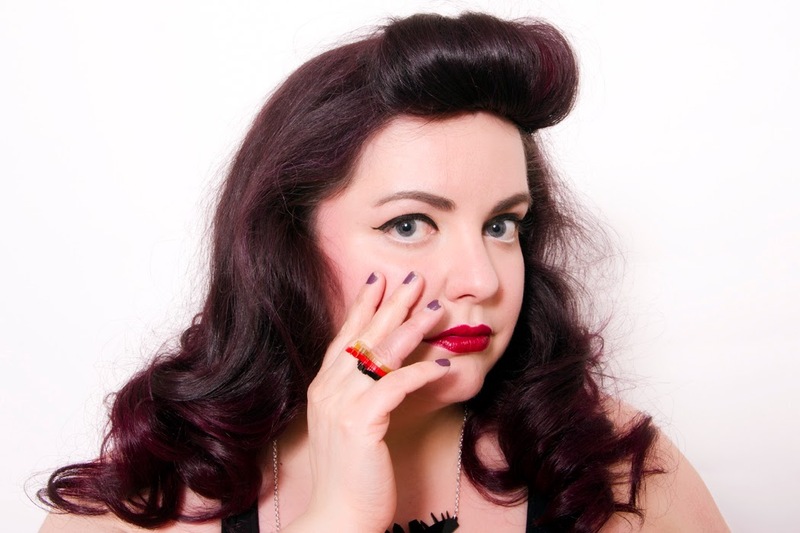 Designed so you can wear all together or individually, these stacking rings are laser cut and come in a choice of three sizes. Both the necklace and rings have matching items within their collection, and Snapdragon Designs also feature other fairy tales including Alice In Wonderland, Cinderella and more. You can see it all in their Folksy shop here. That London necklace is too too gorgeous! Must have! I love a statement accessory like that - LUSH! We are such style twins gorgeous girl! 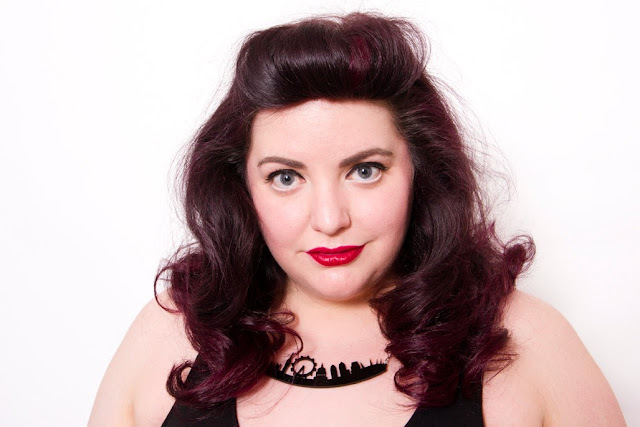 I'd fancy each buying the same dress and styling it on our blog - what do you think?